bKash Chief Commercial Officer Mizanur Rashid and Asrotex Group Chief Financial Officer Syed Ashraful Islam exchange documents after signing an agreement on salary payment at bKash head office in the capital recently. bKash Limited, the largest mobile financial service provider in the country, recently signed an agreement with Asrotex Group, the leading RMG manufacturer of the country. Under the deal, about 17 thousand RMG workers of Asrotex Group will get their salary through bKash account from now, said a press release. 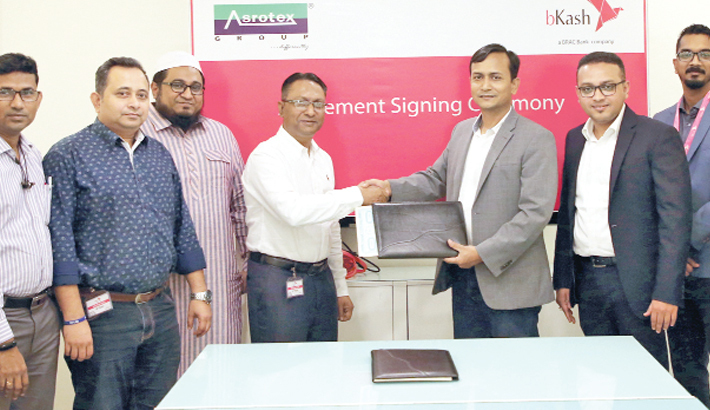 Mizanur Rashid, Chief Commercial Officer (CCO) of bKash and Syed Ashraful Islam, Chief Financial Officer (CFO) of Asrotex Group signed the deal on behalf of their respective organisations at bKash head office in the capital. Sarabar Kumar Chanda, Lead, RMG Business, Rifat Rahman, Acquisition Manager of Commercial department of bKash and Md. Shakhawat Hossain Bhuiyan, Director, Md. Anwar Zahid Shimul, Director, SCM and Business Development of Asrotex Group were also present.